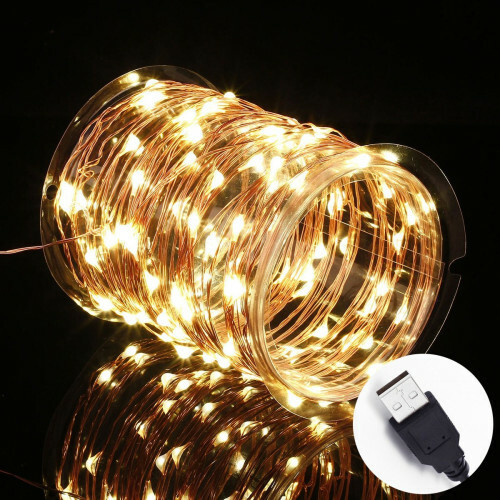 Our gorgeous starry string lights equip with USB socket that greatly extend the usage scenarios. 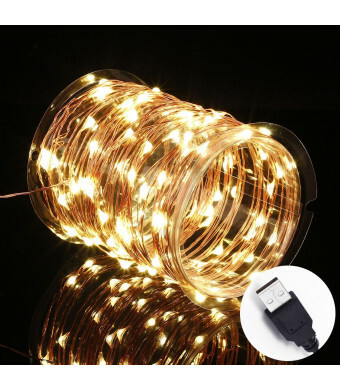 Now you can light up the string lights with mobile power bank and use it almost anywhere you like such as outdoor, camping, indoor, bedroom, party, wedding, cafe, commercial decoration etc. The included UL certificated USB AC/DC power adapter alternatively lets you use it with outlet. This tiny USB power adapter can be used as charger for your variety digital devices also. What makes us different? Innotree's string lights use premium quality LED bulbs only and golden lacquer coated copper wires. Stay away from those cheap items with naked copper wire and tiny LED bulbs. Cost Effective and energy efficient. The LED string lights will not overheat and remain cool after prolonged usage, making it safe and reliable. 2700-2900K warm white 100 LEDs with 33Ft long string lights will illuminate a dark corner and create a romantic atmosphere in your home, restaurant or shops. Copper wire is IP65 waterproof, USB adapter is 110-240V input and 5V/1.5A output without waterproof. We offer 30 days money back and 18 months NO Questions asked warranty GUARANTEED.